Despite all of the pictures of our touring adventures, I did actually go to France to work. I was singing a concert version of Mozart's Don Giovanni with the group pictured above, Opera Fuoco. I grabbed a few shots at one of our rehearsals. The conductor is David Stern, who is the son of Isaac Stern- the legendary violinist. The orchestra is playing on period instruments (gut strings, classical bows). They were an incredible ensemble- really tight, expressive playing. David was a pleasure to work with. The level of detail involved in the preparation was exceptional. Here is Don Giovanni and Leporello. After the concert with some of the team. It was extremely well received- the audience would not stop applauding. 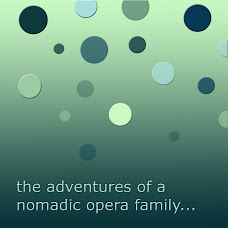 Opera Fuoco has a pretty loyal following, but David said it was an unprecedented response. I was a bit frustrated with my own performance. I was just kind of worn out from our last week's accommodations. I had late rehearsals most of the week (getting home after midnight) and Colin waking up at 6:00 am in the same room was a little difficult, although Ann tried her best to keep him quiet so I could get a little more sleep. Those of you who know Colin know quiet is not an aspect of his native temperament. We also met our babysitters on the Trocadero in the afternoon before the concert for Ann to take pictures of their daughter (see below). I thought I could just hang with Colin while they shot pictures- take it easy. But I stupidly lost track of Ann on the very busy square and spent the next half hour or so frantically looking for her with Colin in tow. He is getting heavy. Probably not the best way to relax before a big performance. Oh well. The conductor has invited me back for the fully staged version next year, so I will hopefully have some more chances to sing it more to my own expectations. A few things we will miss from Paris. . .
On our second to last night in Paris, walking home we were lucky to encounter the last of this beautiful evening light. We ended our stay with two days of beautiful, mild weather which seems to make everything better. We traveled home well. Colin was such a great little traveler, even on our more than 8 hour flight and two other connecting flights (Paris-Chicago-Las Vegas-Salt Lake). We spent the night in Las Vegas and were able to meet a dear friend for a breakfast buffet at Caesar's Palace. It was amusing to come from Paris to Las Vegas, since the Strip has such a fake beauty. I'll have to encourage Brian to post about the concert. He sounded great and the audience could not get enough. As we were walking away, the strobe lights began firing- marking the 6:00 hour. The chocolate one was filled with creme brulee. On Saturday we met up with our friends from church and in a small exchange for all the help they have offered us (helped us move across Paris and watched Colin for a long time so I could go to Brian's concert), I took some photos of their darling little girl. Too bad this backdrop is not more handy to me. She is a very cute little girl and I love her baby curls. Colin had a great time playing with her. Here is a sunrise taken from our kitchen window the other morning. My opening of the window to take this photo caused a major toddler tantrum as he wanted to play out the open window. Here is a shot of our servant quarters. The small space has been a lot harder on me than I expected. (The stairs have not been so bad as Colin has usually only has me carry him up about 2 flights. The stairs are still a bit of a novelty for him.) It is a nice little apartment and could be a lot worse, but it has been a little hard. I feel kind of silly having a hard time since I have lived in MUCH more difficult circumstances during my two years in Latin America. I have very different circumstances at present with a toddler and 6 months pregnant. The neighborhood is beautiful with amazing architecture and window shopping. We can only afford the window shopping, especially around here. Brian got this shot of the moon and the Eiffel Tower last night. We are happy to have this view. I hope the former servants enjoyed it too. Since our servant quarters are close to the Eiffel Tower, we took a little walk there the other morning. It was a very bright morning. Colin admiring the "big tower" as he was saying. There was a park across from the Eiffel Tower where Colin had a great time. He thinks he is the only child allowed on the playground toys these days. When other kids also try to play Colin starts yelling "no sharing!" since we have told him over and over to share. I am quite glad most people do not know what he is most enthusiastically expressing. He needs a sibling, and we are working on it. We completed our 4th move within Paris on Sunday. Through some sort of miracle, we were speaking to a lovely woman at church yesterday, mentioned our move, and she offered her husband and their car to pick us up and get us across the city. It probably would have taken Brian three trips on the subway to get all of our things over here as from Cite Universitaire to our new location involves three different subway lines to make the transfer. With France’s severe lack of elevators and the additions of a stroller, toddler, and pregnant wife, well, a few things (like moving across the city) are just a bit harder. I frequently talk to Brian about how if I were not pregnant and with a toddler and 10 years younger that we would be having a very different time in France. We are just in a reproductive stage and that is all good also. And, the car ride was our first time in a car since New Years’ Eve. Colin was excited by the novelty. So the nice people from church even invited us over to dinner which was a welcome break for company and great food (especially since we had tried to eat most of our food so as not to move it across Paris). They live in an incredible apartment, really I think possibly the most beautiful apartment I have ever seen. The details in the apartment were much more elaborate than the very posh flat I stayed at in Hyde Park, London. We really had a lovely evening. They have a little girl about Colin’s age and most of the time they enjoyed playing with each other. The apartment building we are in is very up-scale, but we are staying in a small flat in former servant quarters. The side door we enter even says “SERVICE” over it still, and we are 5 flights up a little narrow staircase. We both feel very out of shape when we climb all the stairs. This is a little crazy with Colin, but we can do anything for a few days. We have left the stroller just inside the door downstairs, which I hope is ok. The flat has had an Ikea makeover fairly recently and is nice but small. We got a lot spoiled in our last place with the well-equipped kitchen, multiple rooms, and lack of five flights of servant stairs. Our current “kitchen” has a small fridge, sink, and a low heat hot plate. It has been like trying to boil water with a light bulb but we have successfully made oatmeal, hard boiled eggs, and I heated pre-made soup for dinner. We are in a great location and a have view of the Eiffel Tower from the kitchen. The tower has strobes that flash on the hour after dark and Colin likes that. We still need to find the nearest playground and get an extra key so Brian is not locked out if I keep the keys and I am not locked in if Brian takes them. This little flat will make us kind of excited to be home next week. There are so many things we love about Europe (history, beauty, bread, dairy products, and chocolate to name a few) but America is so easy and cheap. We were talking the other night about why America can’t be more like Europe and I think it is exactly because we make things easy and cheap. Brian’s concert is on Saturday. We then head to Las Vegas on Sunday. (We got much cheaper flights out of Las Vegas and go onto SLC on Monday.) It was fairly reasonable so we booked a hotel on the Strip. We figure with the jet lag we may be up in the middle of the night, so may as well go see a Bellagio fountain show and get a fancy buffet breakfast. A few hours is all I need of the Strip these days. We used to go down to Vegas in college which brings up the if I were 10 years younger again. In honor of our friend Dana Lee who is suffering the effects of a winter storm this long weekend in NC, Brian sends her these cheerful snowflakes. 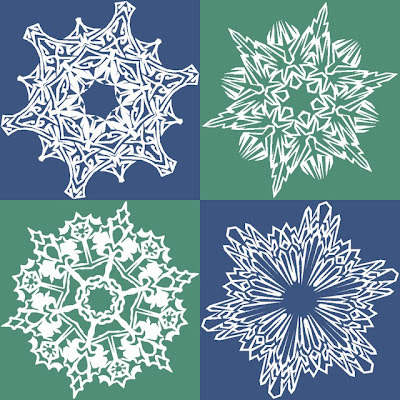 He has been a bit obsesed with making snowflakes on http://snowflakes.lookandfeel.com/ and when I say obsessed, I mean a great deal of his computer time is spent making snowflakes. I can see the snowflakes reflected in his glasses at times and if he does not turn the computer sound down I hear the little snip, snip, snip sound that the computer makes as the snowflake is made. He is good at it, as he used to be in charge of making snowflakes for his family's Christmas decorations. He hopes someone will find his snowflakes on-line and use them as clip art for an office Christmas party invitation. My on-line time-wasting is spent making a 2006-2007 Stuckihouse book on blurb.com and getting into trouble on ebay. We hope to do a yearly book from the blog to help us keep track of our comings and goings. As for now, enjoy Brian's beautiful snowflakes. So after a nice morning in the gardens, we got Colin asleep in the stroller and made our way inside. On our way to the ticket kiosk, we received the lovely news that strollers are NOT allowed inside the Chateau. Vraiment. The message seems to be toddlers aren't welcome here, and most French families probably know this. I wanted to slap the lady (all French like) who then suggested we might like to tour the grounds instead, as we had just done that for several hours, and now the weather had turned beyond nasty. Ann was ready to just leave, but I wanted to see if I could get Colin to sleep in his sling during at least part of the tour. So we paid the exorbitant entry fee, checked our stroller, and started inside with a HUGE child sleeping in the sling hammock style. He was getting a great response from the other tourists. Welcome to Louis 14's personal household church. This was one of the final building projects during his lifetime. In the Chapel, I sat down on the floor because dead weight Colin was taking his toll. The attendant came and tapped me on the shoulder and I assumed I was going to be told that sitting on the floor is not allowed. Instead he offered me his seat and I decided not to have mean thoughts about Versailles' anti-toddler policies. This is the passageway to the Opera, which was closed for restoration. Too bad, I would have liked to see it. I love this picture Ann took though. Colin was trying to blow out the electric candles in the Hall of Mirrors. Then he became fascinated with Ann's scarf. Then, he showed his disapproval of Baroque excess by staging a lay-in on the floor of the Hall of Mirrors. I was totally unfazed by the disapproving glances. If you don't want toddlers laying on the floor, allow strollers. What kind of Nelly sleeps in a bed like this? Oh yeah, Louis the 14th. We read on wikipedia about his elaborate wake up routine- levee. He was pretty clever though, as all of the machinations centered around Versailles were designed to occupy the nobility away from their own homes so that they couldn't pull power away from his center. Colin shares his final thoughts on the Chateau de Versailles. We're glad we went in though. We don't have to do it again now for a long time.